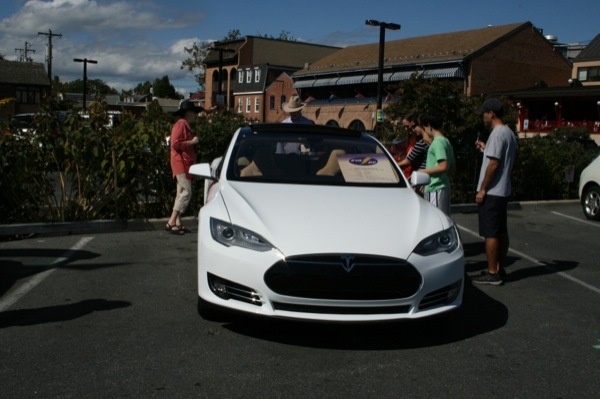 Rob Neigbour's 2013 Tesla Model S attracted a lot of attention. © 2013 Bonita Jorgensen: permission is granted to use this photo to report, support or promote National Drive Electric Week events provided photo credit is given as shown above. All other uses prohibited unless written permission is granted by the owner. © 2013 Michigan EAA and Michigan TeslaOwners: permission is granted to use this photo to report, support or promote National Drive Electric Week events provided photo credit is given as shown above. All other uses prohibited unless written permission is granted by the owner. 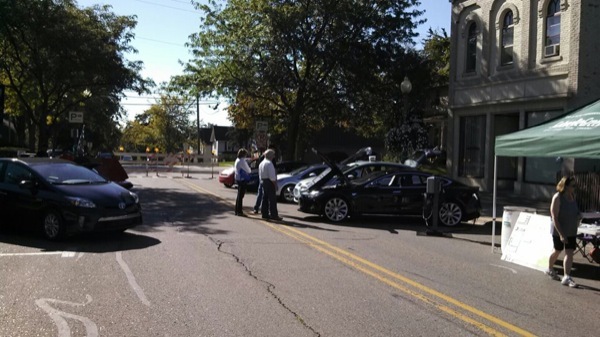 Four Tesla Model S, and one Roadster are visible. A Fisker Karma is obscured and an orange Corbin Sparrow is partially visible. In the distance, a converted Toyota Pickup can also be seen. 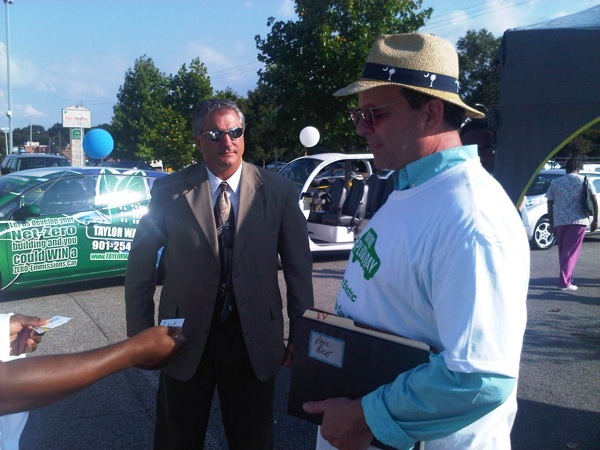 © 2013 Dean Miller: permission is granted to use this photo to report, support or promote National Drive Electric Week events provided photo credit is given as shown above. All other uses prohibited unless written permission is granted by the owner. 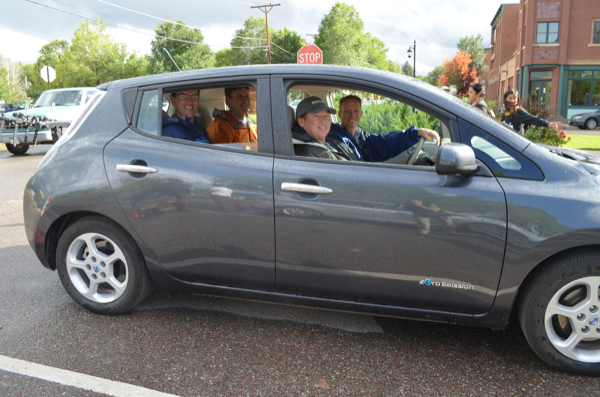 2013 Nissan LEAF leased by Reed Burkholder (not pictured). © 2013 James Blakely: permission is granted to use this photo to report, support or promote National Drive Electric Week events provided photo credit is given as shown above. All other uses prohibited unless written permission is granted by the owner. © 2013 State of Vermont: permission is granted to use this photo to report, support or promote National Drive Electric Week events provided photo credit is given as shown above. All other uses prohibited unless written permission is granted by the owner. © 2013 Cam Burns CLEER: permission is granted to use this photo to report, support or promote National Drive Electric Week events provided photo credit is given as shown above. All other uses prohibited unless written permission is granted by the owner. © 2013 Fiat of Fresno: permission is granted to use this photo to report, support or promote National Drive Electric Week events provided photo credit is given as shown above. All other uses prohibited unless written permission is granted by the owner. © 2013 Richard Williams: permission is granted to use this photo to report, support or promote National Drive Electric Week events provided photo credit is given as shown above. All other uses prohibited unless written permission is granted by the owner. 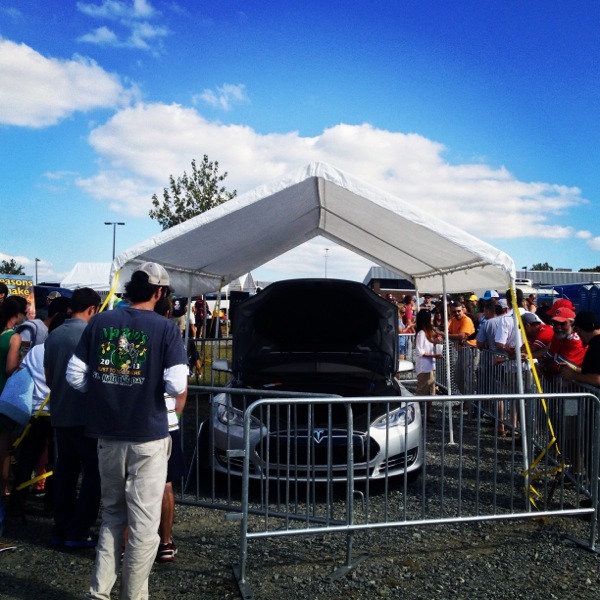 Leilani Munter and her P85+ Tesla Model S on display at Charlotte Oktoberfest. 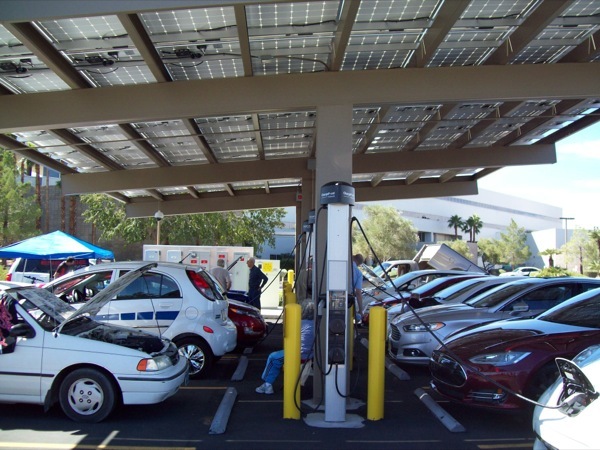 © 2013 Craig Davidson: permission is granted to use this photo to report, support or promote National Drive Electric Week events provided photo credit is given as shown above. All other uses prohibited unless written permission is granted by the owner. 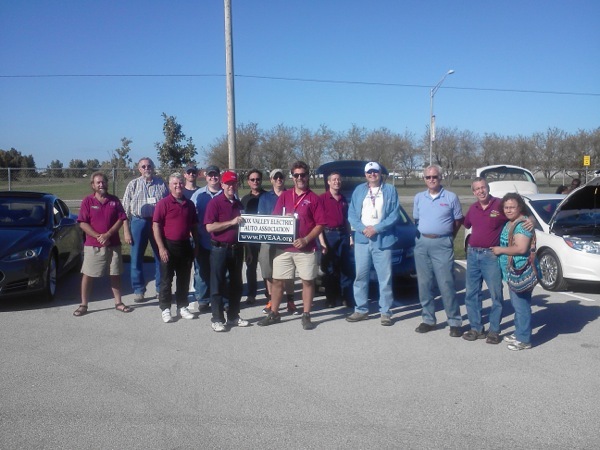 A few of the participating Fox Valley Electric Auto Association (FVEAA) members are shown left to right: Ted Lowe, James Schmidt, Dennis Doney, Chris Young, David Zygmont, Bruce Jones, Sam Carnavacciolo, Grant Gerke, Rich Hirschberg, Todd Martin, George Gladic, Steve Grushas, Bob Baker, Maria Baker Cars in background left to right Tesla Model S, Chevrolet Volt, Ford Focus Electric. The FVEAA rally and ride-n-drive event was held at the city-owned car test track in Naperville IL, about 30 miles west of Chicago. 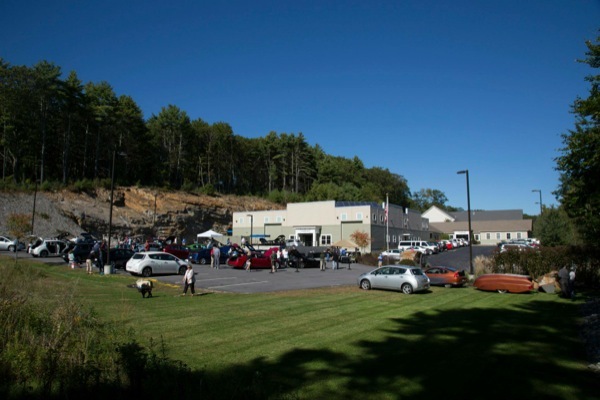 This is the only city-owned test track in the nation where car dealers take prospective buyers to test vehicles on a closed circuit track complete with wet brake skid test area, acceleration lane, rocky hill climb, as well as various smooth and rough terrains to provide drivers and passengers a feel for vehicle performance. 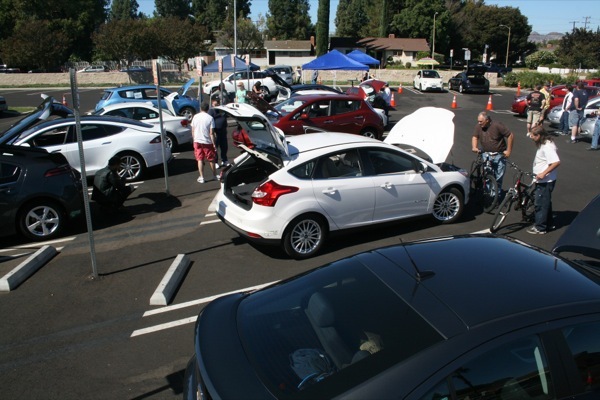 The day was a complete success with roughly 70 test drives of electric vehicles, and s display of 26 electric cars and trucks. © 2013 Dobrin (Dio) Vesselinov: permission is granted to use this photo to report, support or promote National Drive Electric Week events provided photo credit is given as shown above. All other uses prohibited unless written permission is granted by the owner. 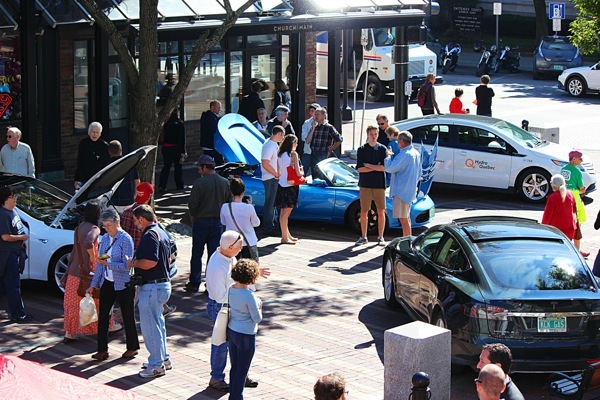 © 2013 Patrick Brisson: permission is granted to use this photo to report, support or promote National Drive Electric Week events provided photo credit is given as shown above. All other uses prohibited unless written permission is granted by the owner. 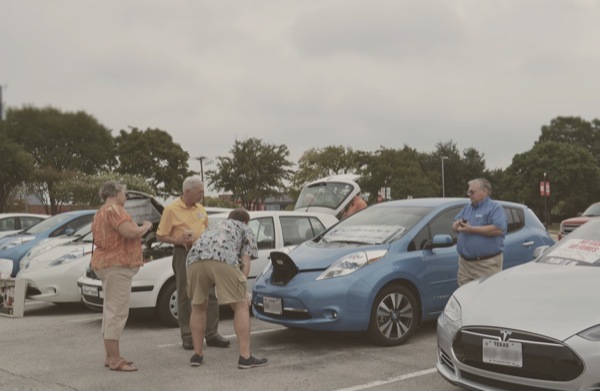 Demonstrating the benefits of electric vehicles to shoppers at MOM's Organic Market in College Park, Maryland by giving rides and test drives. © 2013 Lanny Hartmann: permission is granted to use this photo to report, support or promote National Drive Electric Week events provided photo credit is given as shown above. All other uses prohibited unless written permission is granted by the owner. © 2013 North Central Texas Council of Governments: permission is granted to use this photo to report, support or promote National Drive Electric Week events provided photo credit is given as shown above. All other uses prohibited unless written permission is granted by the owner. 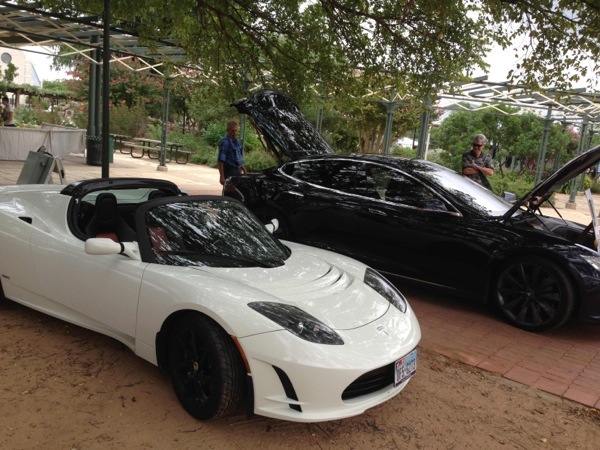 White Tesla Roadster and black Tesla Model S.
© 2013 Barbara McMillen: permission is granted to use this photo to report, support or promote National Drive Electric Week events provided photo credit is given as shown above. All other uses prohibited unless written permission is granted by the owner. © 2013 J. Isaacs/Bucks County Renewables: permission is granted to use this photo to report, support or promote National Drive Electric Week events provided photo credit is given as shown above. All other uses prohibited unless written permission is granted by the owner. 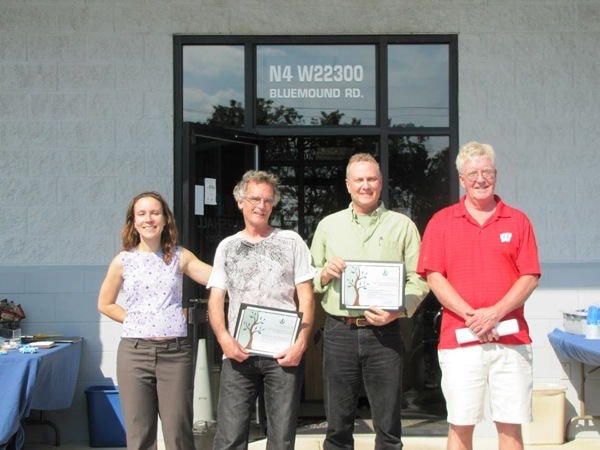 Photo Credit: Ben Faiola/GHEVA(golden horseshoe electric vehicle association). © 2013 Ben Faiola/GHEVA(golden horseshoe electric vehicle association). 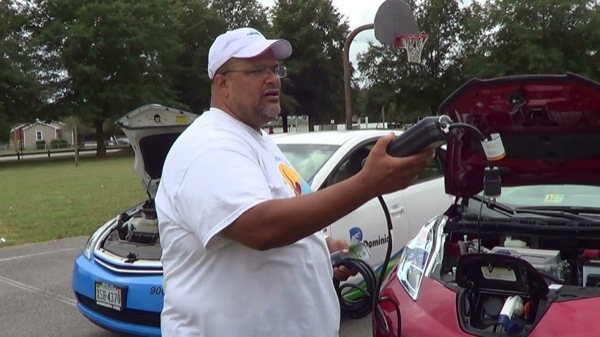 : permission is granted to use this photo to report, support or promote National Drive Electric Week events provided photo credit is given as shown above. All other uses prohibited unless written permission is granted by the owner. © 2013 Mark Geduldig-Yatrofsky: permission is granted to use this photo to report, support or promote National Drive Electric Week events provided photo credit is given as shown above. All other uses prohibited unless written permission is granted by the owner. 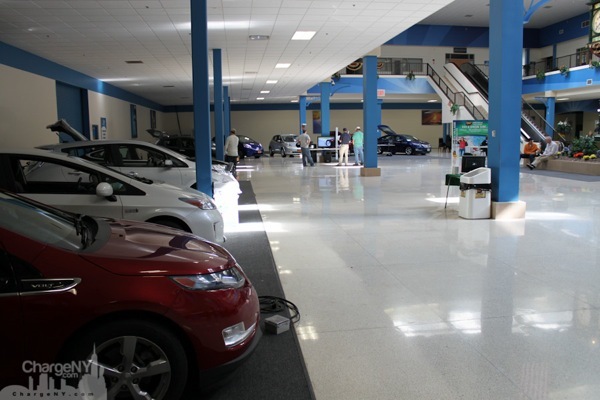 Chevrolet Volt, Fisker Karmas, Telsa Roadsters, Tesla Model S and Nissan Leaf. © 2013 Mel: permission is granted to use this photo to report, support or promote National Drive Electric Week events provided photo credit is given as shown above. All other uses prohibited unless written permission is granted by the owner. 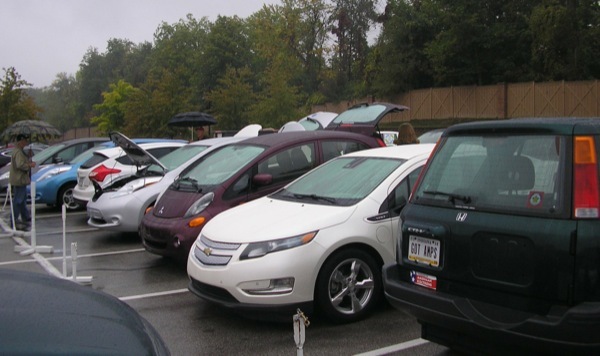 A nice red, white, and blue representation with a Chevy Volt, Plug in Prius, and Nissan Leaf. © 2013 Tennessee Valley EV Drivers: permission is granted to use this photo to report, support or promote National Drive Electric Week events provided photo credit is given as shown above. All other uses prohibited unless written permission is granted by the owner. 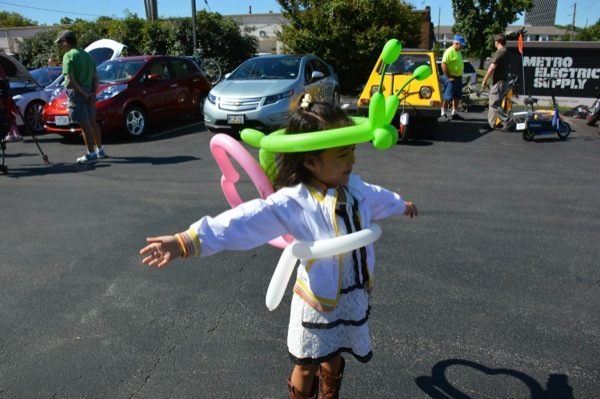 © 2013 Cheryl Olson - Hoosier EVA: permission is granted to use this photo to report, support or promote National Drive Electric Week events provided photo credit is given as shown above. All other uses prohibited unless written permission is granted by the owner. 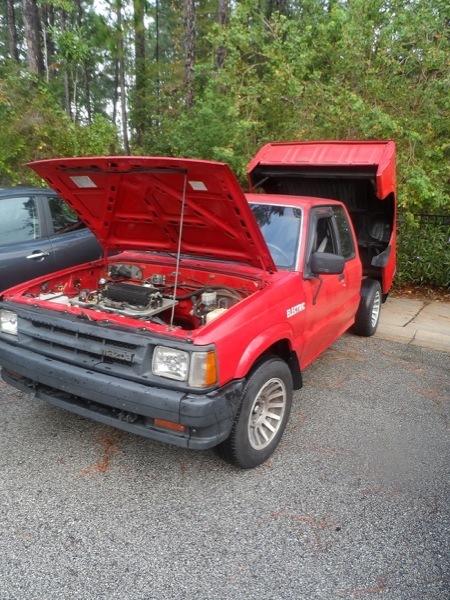 Homemade Electric Vehicle - 1990 Mazda pickup truck converted to an electric vehicle. Bob (owner) said he gets 40 miles per charge). Cool! © 2013 Joel Relova: permission is granted to use this photo to report, support or promote National Drive Electric Week events provided photo credit is given as shown above. All other uses prohibited unless written permission is granted by the owner. 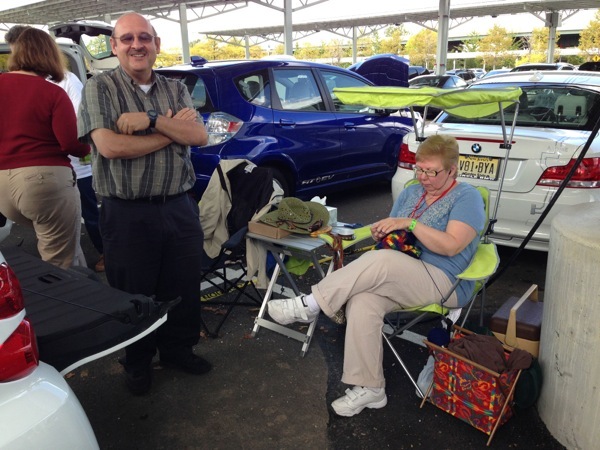 Dennis and Diane chilling out with 'Sparky' their SmartED at Liberty Science Center. © 2013 Michael Thwaite, Plug In America: permission is granted to use this photo to report, support or promote National Drive Electric Week events provided photo credit is given as shown above. All other uses prohibited unless written permission is granted by the owner. 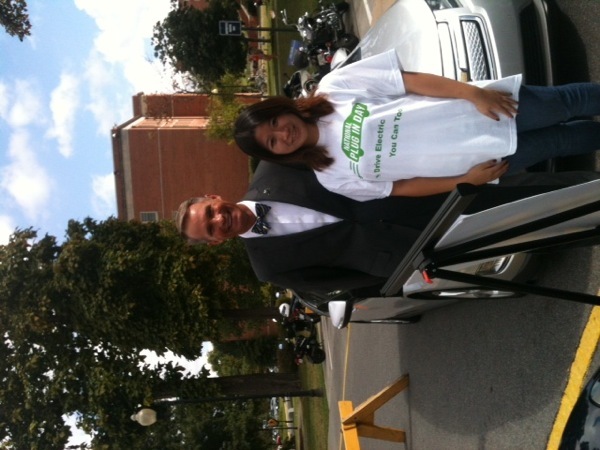 © 2013 ETSU Department of Sustainability: permission is granted to use this photo to report, support or promote National Drive Electric Week events provided photo credit is given as shown above. All other uses prohibited unless written permission is granted by the owner. 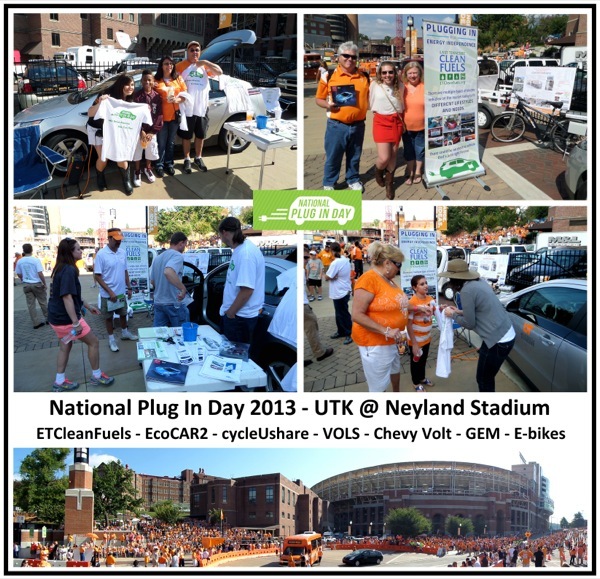 Top left - Family loving NPID & Chevy Volt! Top right - Leaf owners that LOVE their Leaf! 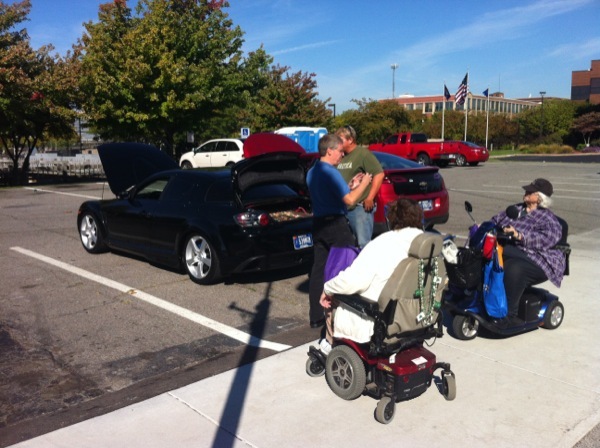 Middle left - Jonathan Overly (orange visor) & Casey Langford (white shirt) discuss a Chevy Volt with interested customers. 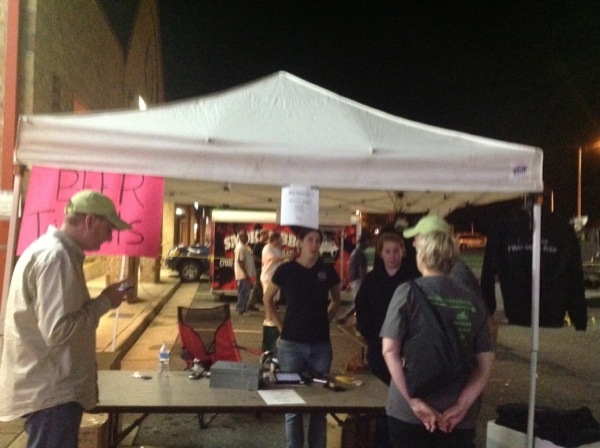 Middle right - Kristy Keel-Blackmon (hat) discusses EVs with a young learner and gives her a t-shirt! Bottom - The almost 180 degree view of the massive Gate 21 entrance area to Neyland Stadium... we were in the crowd in the middle right of the picture! © 2013 East TN Clean Fuels Coalition: permission is granted to use this photo to report, support or promote National Drive Electric Week events provided photo credit is given as shown above. All other uses prohibited unless written permission is granted by the owner. © 2013 Stan Hanel: permission is granted to use this photo to report, support or promote National Drive Electric Week events provided photo credit is given as shown above. All other uses prohibited unless written permission is granted by the owner. © 2013 Mark Neumann: permission is granted to use this photo to report, support or promote National Drive Electric Week events provided photo credit is given as shown above. All other uses prohibited unless written permission is granted by the owner. Vladi Ivanova, Sarah Meyers, Lanny Hartmann and Vera Schoeters, all captains who helped make this event an amazing success, especially Sarah at Bad Wolf Brewery! © 2013 Jeffrey C. Jacobs: permission is granted to use this photo to report, support or promote National Drive Electric Week events provided photo credit is given as shown above. All other uses prohibited unless written permission is granted by the owner. Paul Rice, making things happen! © 2013 Joe Ozegovich: permission is granted to use this photo to report, support or promote National Drive Electric Week events provided photo credit is given as shown above. All other uses prohibited unless written permission is granted by the owner. 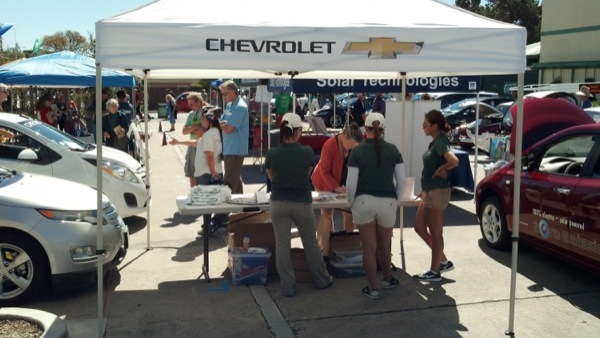 Chevrolet display sponsored by Chevrolet of Watsonville; Rick Chace, fleet manager, (blue shirt)in background. 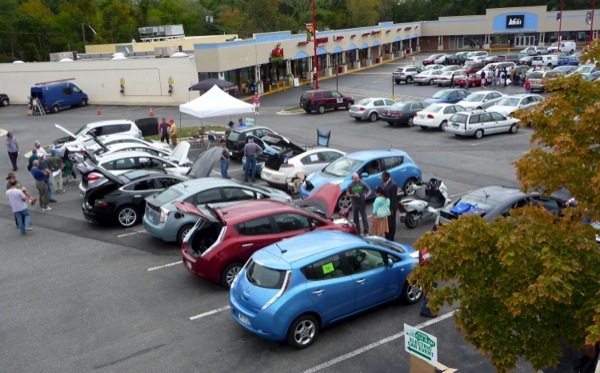 Nissan Leaf on the right displayed by Bill Meade, owner. © 2013 Jack Brown, Electric Auto Association Central coast: permission is granted to use this photo to report, support or promote National Drive Electric Week events provided photo credit is given as shown above. All other uses prohibited unless written permission is granted by the owner. 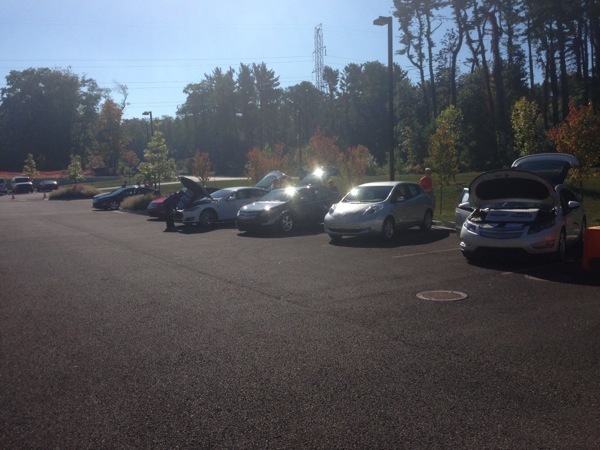 Group shot of 10 EV/PHEVs in front of the CCSU administration building. 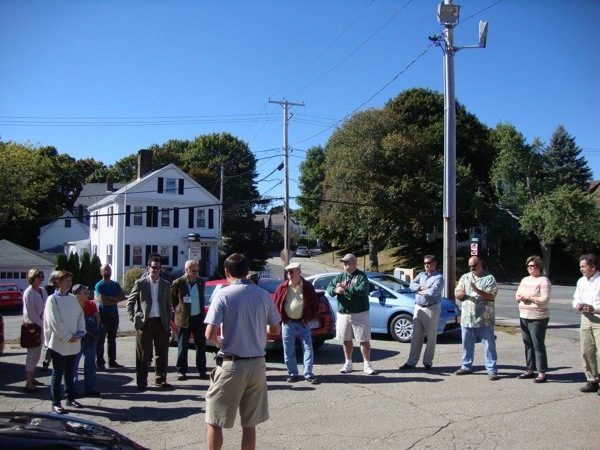 We paused here for a group shot before our rally to the GE charging suite of ten EVSEs in Plainville, CT.
© 2013 Dave Oliveria: permission is granted to use this photo to report, support or promote National Drive Electric Week events provided photo credit is given as shown above. All other uses prohibited unless written permission is granted by the owner. 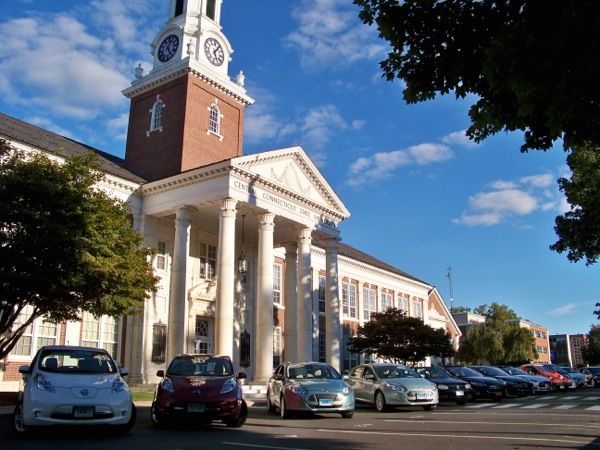 Tesla S, Nissan Leaf, Chevy Volt, Toyota Prius, BMW ActiveE, Ford Focus EV, Chevy Spark EV, Toyota RAV4 EV, Ford F150 retrofitted with ALTe PT. © 2013 Empire Clean Cities: permission is granted to use this photo to report, support or promote National Drive Electric Week events provided photo credit is given as shown above. All other uses prohibited unless written permission is granted by the owner. 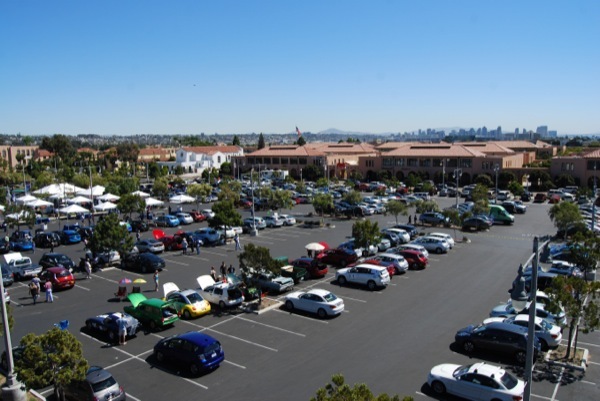 Chevrolet Volt, Tesla Model S, Ford Focus Electric, Fiat 500e, Nissan Leaf, BMW Active E, Toyota Rav4EV. Lenn Goodside, Mariel Knoll, Tom Tcimpidis, Sandra Minasian, Richard Doherty, Unknown Ortopan, Allen Savedoff, Harlan Flagg, and many other unknown are in the picture. © 2013 Eric Doroski: permission is granted to use this photo to report, support or promote National Drive Electric Week events provided photo credit is given as shown above. All other uses prohibited unless written permission is granted by the owner. Photo of participants at the 2013 NPID in ORlando. This year we had tripled the number of display vehicles from last year, with 35 demonstration vehicles. 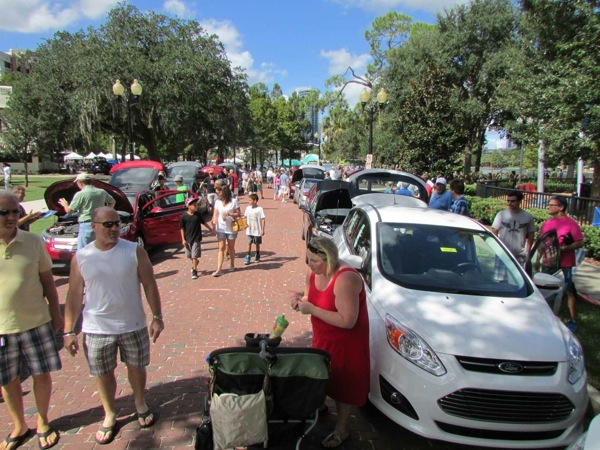 There were about 1000 attendees and about 15 people participated in Ride and Drives. © 2013 Get Ready Central Florida: permission is granted to use this photo to report, support or promote National Drive Electric Week events provided photo credit is given as shown above. All other uses prohibited unless written permission is granted by the owner. 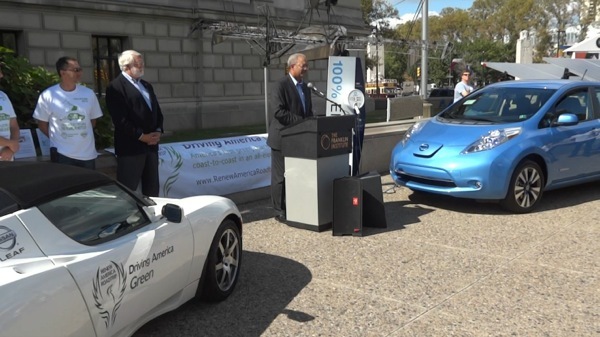 Congressman Chaka Fattah, Dr. Dennis Wint - CEO Franklin Institute, Renew America Roadtrip's Tesla Roadster, Exton Nissan's Leaf. © 2013 Renew America Roadtrip: permission is granted to use this photo to report, support or promote National Drive Electric Week events provided photo credit is given as shown above. All other uses prohibited unless written permission is granted by the owner. © 2013 Laurie Curtis: permission is granted to use this photo to report, support or promote National Drive Electric Week events provided photo credit is given as shown above. All other uses prohibited unless written permission is granted by the owner. © 2013 TideSmart Global: permission is granted to use this photo to report, support or promote National Drive Electric Week events provided photo credit is given as shown above. All other uses prohibited unless written permission is granted by the owner. 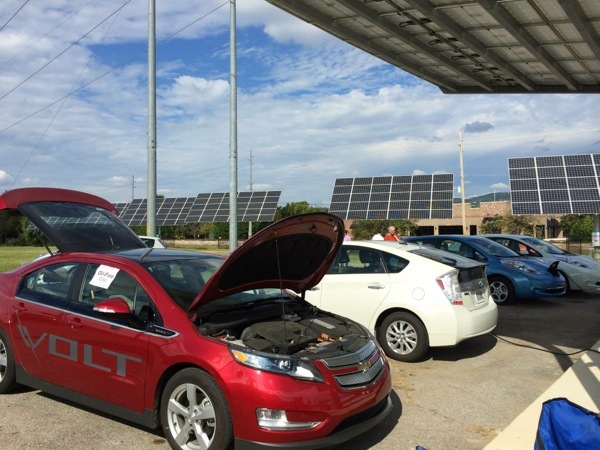 EV Rally! Two Volts followed by two Leafs followed by four Model S's caravaned from Putnam Family Day to Cargil's Chevy dealership for charging. © 2013 Bill Peterson: permission is granted to use this photo to report, support or promote National Drive Electric Week events provided photo credit is given as shown above. All other uses prohibited unless written permission is granted by the owner. 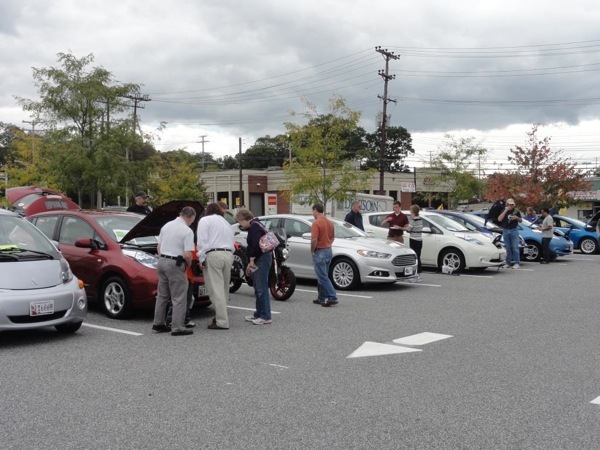 © 2013 Bob Kanauer: permission is granted to use this photo to report, support or promote National Drive Electric Week events provided photo credit is given as shown above. All other uses prohibited unless written permission is granted by the owner. © 2013 MEAA and Michigan Tesla Owners: permission is granted to use this photo to report, support or promote National Drive Electric Week events provided photo credit is given as shown above. All other uses prohibited unless written permission is granted by the owner. © 2013 Vanessa Minei: permission is granted to use this photo to report, support or promote National Drive Electric Week events provided photo credit is given as shown above. All other uses prohibited unless written permission is granted by the owner. 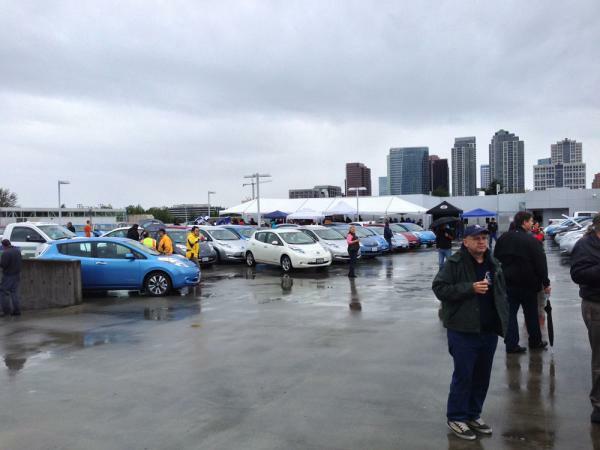 Incredible turnout for Bellevue, WA, National Plug In Day event, despite wind and rain. © 2013 Tom Saxton, Plug In America: permission is granted to use this photo to report, support or promote National Drive Electric Week events provided photo credit is given as shown above. All other uses prohibited unless written permission is granted by the owner. 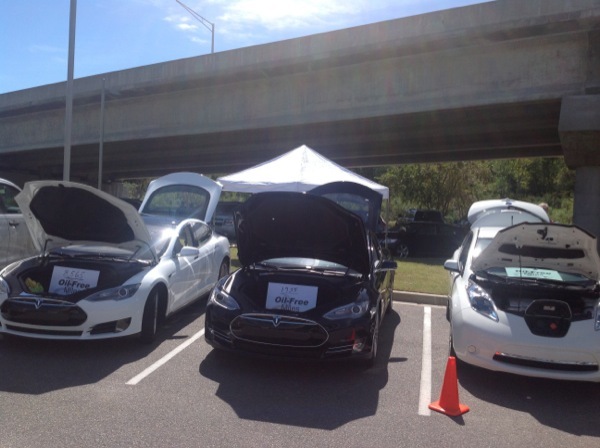 © 2013 Steve francis: permission is granted to use this photo to report, support or promote National Drive Electric Week events provided photo credit is given as shown above. All other uses prohibited unless written permission is granted by the owner. 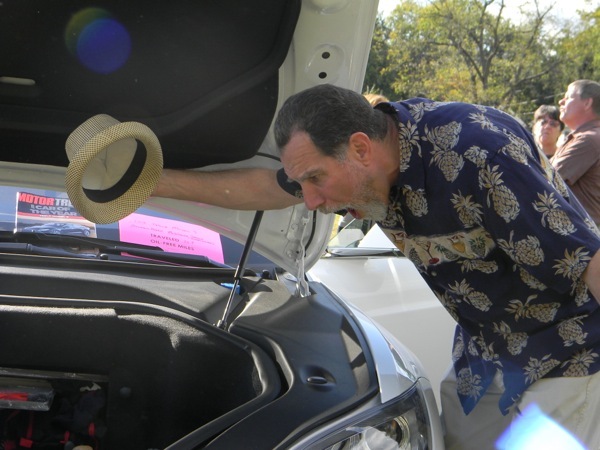 © 2013 Gloria Bondad - 1 of 2 Event Photographers: permission is granted to use this photo to report, support or promote National Drive Electric Week events provided photo credit is given as shown above. All other uses prohibited unless written permission is granted by the owner. © 2013 ChargeNY.com: permission is granted to use this photo to report, support or promote National Drive Electric Week events provided photo credit is given as shown above. All other uses prohibited unless written permission is granted by the owner. 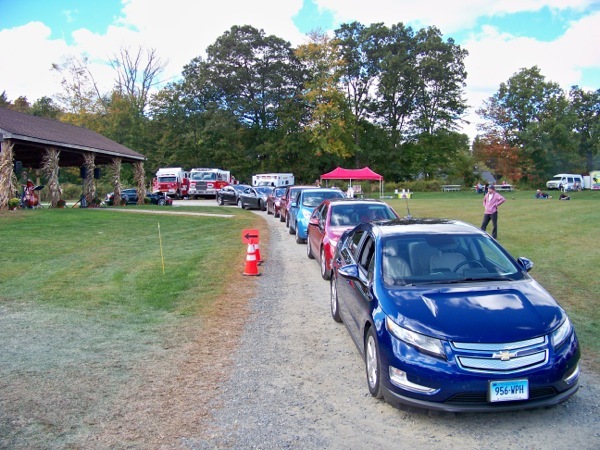 From right to Left: Mitsubishi iMiEV Nissan Leaf Zero Motorcycle Ford Fusion Energi Leaf Honda Fit Leaf Ford Focus EV The event was too large to capture in one photo. 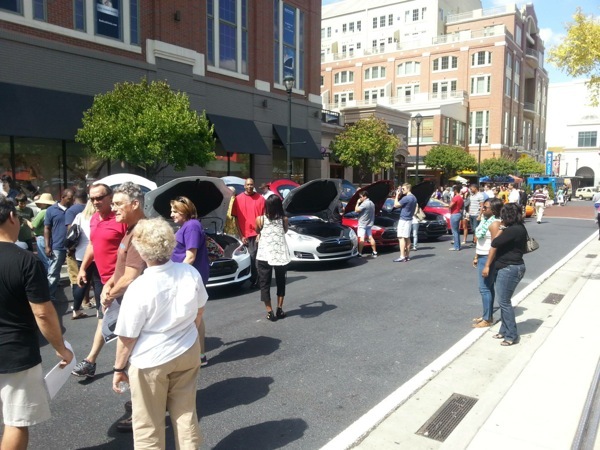 © 2013 Barry Larkin: permission is granted to use this photo to report, support or promote National Drive Electric Week events provided photo credit is given as shown above. All other uses prohibited unless written permission is granted by the owner. 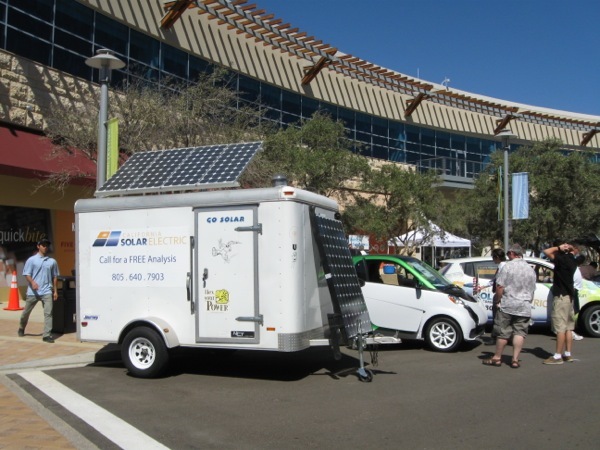 Photo Credit: Bob Harris, owner Black Bear Solar Institute & Leaf driver! 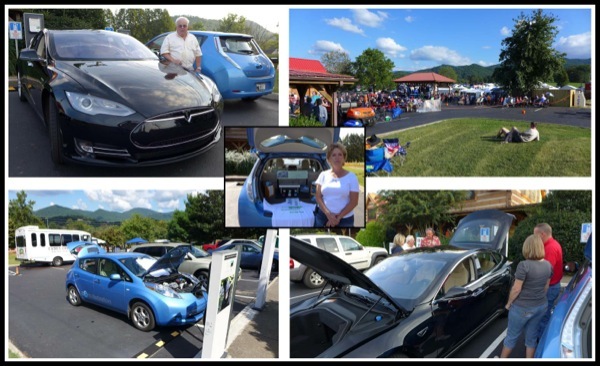 Top left - Henry Tappen and his brand new Model S; center - Tami Vater, Blount County Tourism Director. 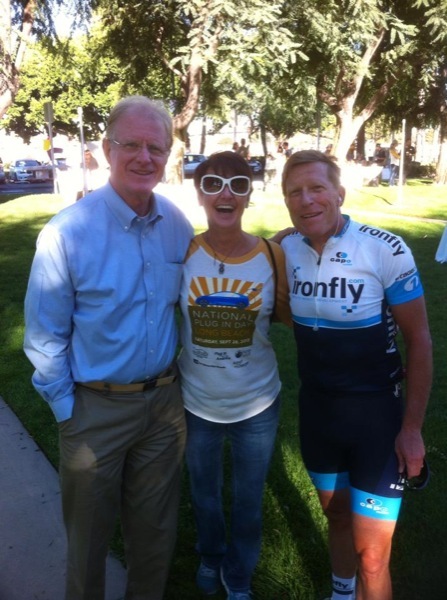 © 2013 Bob Harris, owner Black Bear Solar Institute & Leaf driver! 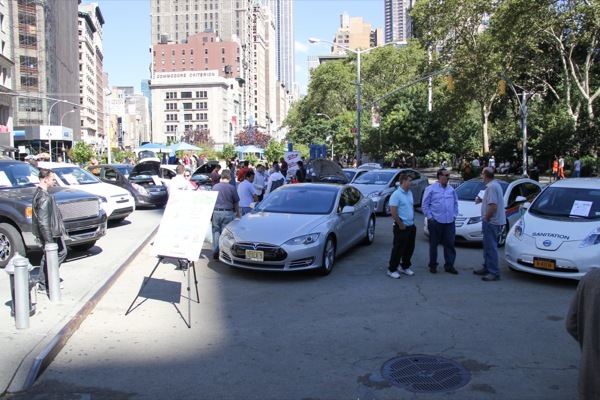 : permission is granted to use this photo to report, support or promote National Drive Electric Week events provided photo credit is given as shown above. All other uses prohibited unless written permission is granted by the owner. 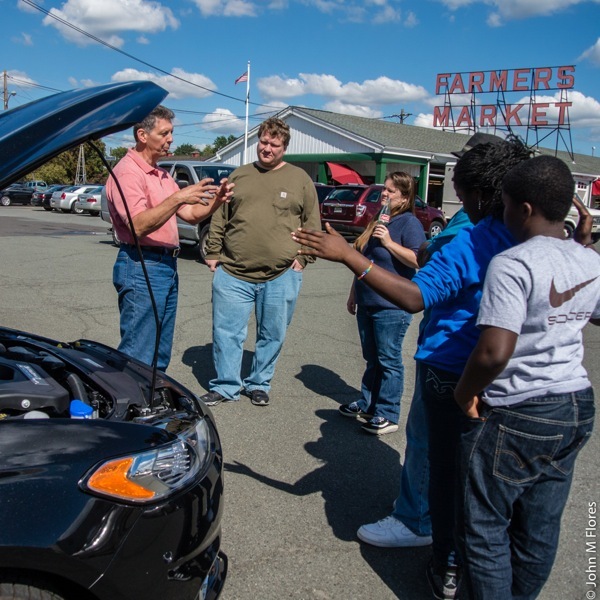 Jerry Ridder talks to people about his Ford Fusion Energi at the Trenton Farmers Market, National Plug In Day 2013, Trenton NJ. 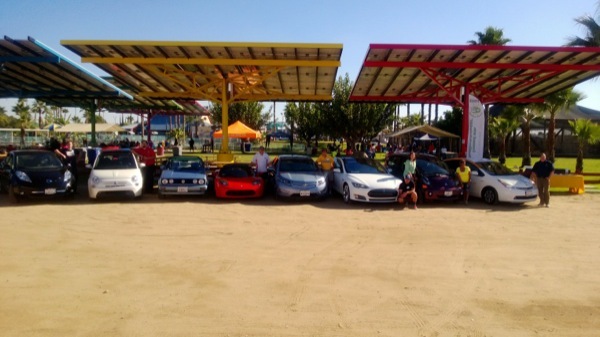 © 2013 John M Flores: permission is granted to use this photo to report, support or promote National Drive Electric Week events provided photo credit is given as shown above. All other uses prohibited unless written permission is granted by the owner. 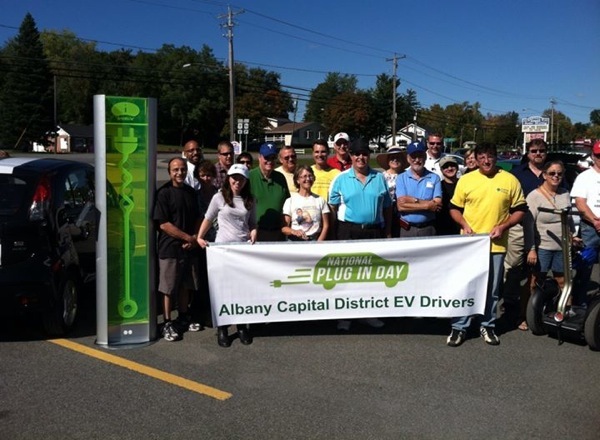 Group photo showing the cars and some owners who helped make the Tri-Cities plug in day event a success. © 2013 David Hrivnak: permission is granted to use this photo to report, support or promote National Drive Electric Week events provided photo credit is given as shown above. All other uses prohibited unless written permission is granted by the owner. 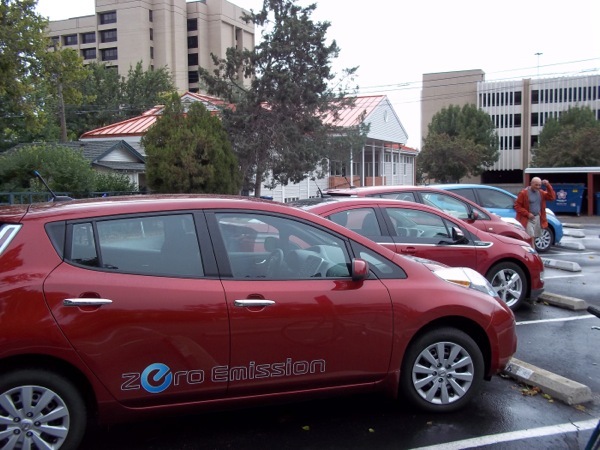 © 2013 Ralph Jenson: permission is granted to use this photo to report, support or promote National Drive Electric Week events provided photo credit is given as shown above. All other uses prohibited unless written permission is granted by the owner. Portable Solar EV Charger by California Solar Electric. © 2013 Stan Cowen, VCAPCD: permission is granted to use this photo to report, support or promote National Drive Electric Week events provided photo credit is given as shown above. All other uses prohibited unless written permission is granted by the owner. 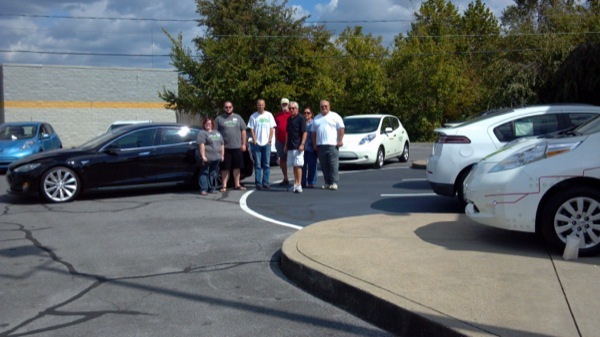 From left to right: Kevin Glotfelty - Red Think City; MOM's customers (couple); Cliff Hunt - White Model S; MOM's customer (woman looking at Leaf); Cyndi Racine & husband - White Leaf; Terrence Kimbrough - White Volt; David Glotfelty - Red Leaf; MOM's customer (man with plate); Bruce Evry and wife - Blue Plug In Prius; Fred Lyles, son, and father - Red Tesla Model S; Jim Bender - blue shirt; Mark Czajka - White Fusion Energi; MOM's customer - woman looking down; Jeff Newman - Reporter with camera; MOM's customer - woman in black shirt facing back. (Panoramic photo taken from the roof of MOM's Organic Market in Waldorf, MD). © 2013 Eric Kriemelmeyer: permission is granted to use this photo to report, support or promote National Drive Electric Week events provided photo credit is given as shown above. All other uses prohibited unless written permission is granted by the owner. © 2013 Eric Cardwell: permission is granted to use this photo to report, support or promote National Drive Electric Week events provided photo credit is given as shown above. All other uses prohibited unless written permission is granted by the owner. © 2013 Elizabeth Ward: permission is granted to use this photo to report, support or promote National Drive Electric Week events provided photo credit is given as shown above. All other uses prohibited unless written permission is granted by the owner. 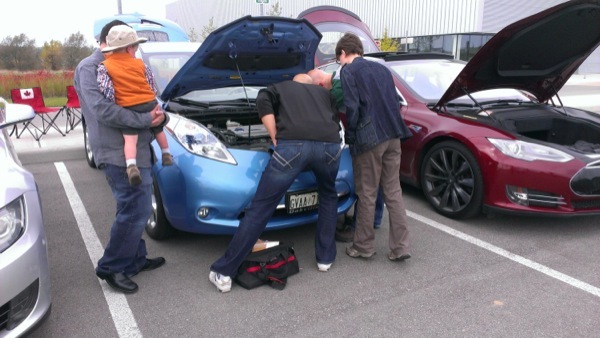 Randy Brooks, Nissan Leaf owner from Chelan Washington points out the charging options to an interested visitor. 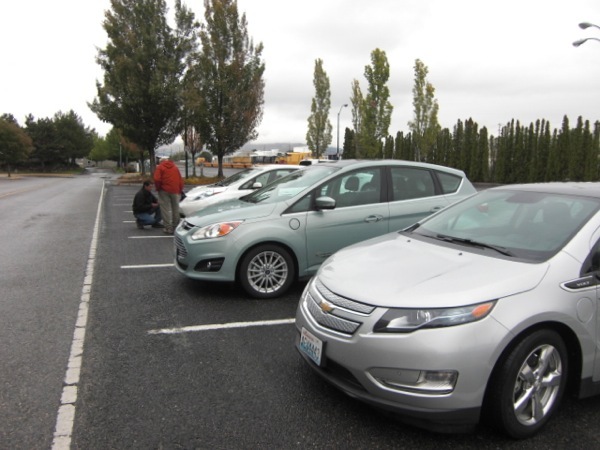 © 2013 Plug-In North Central Washington: permission is granted to use this photo to report, support or promote National Drive Electric Week events provided photo credit is given as shown above. All other uses prohibited unless written permission is granted by the owner.